During the offseason the Eagles had five free agents depart. Will James, Jevon Kearse, Ian Scott, Takeo Spikes, and Thomas Tapeh. How did the Eagles do in replacing these players? It looks like Reid made some smart decisions. In 2007, James was an occasional starter and occasional nickel cornerback. James proved to be more liability than asset to the Eagles. He ended the season with one interception. The Eagles' replacement for James was Asante Samuel. No comparison. 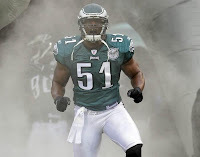 Samuel was a Pro Bowler in 2007 and allows the Eagles to move Sheppard or Brown to the nickel cornerback. The 2007 season was one huge disappointment for Kearse. Kearse collected a measly 3.5 sacks and lost his starting position to Juqua Parker. Over the past weekend Kearse was arrested for a DUI in Tennessee. A brilliant cut by the Eagles. Kearse’s replacement is Chris Clemons. Clemons brings youth and speed to the defensive end position. In spot duty with the Raiders last year Clemons collected eight sacks. Clemons should also lessen the opposition’s focus on Trent Cole. Scott spent his entire 2007 season on Injured Reserve with a knee injury. The Eagles survived 2007 without Scott and will do the same in 2008. The Eagles selected Trevor Laws in the second round of this year’s draft. Laws will serve as the back-up defensive tackle to Patterson and Bunkley. Spikes started 14 games for the Eagles in 2007. He recorded 86 tackles and one sack. More importantly Spikes provided veteran leadership for the team’s young linebacking group. Spikes departure allows the Eagles to move Gaither back to his natural position of WILL linebacker and get Stewart Bradley on the field. To replace Spikes' veteran leadership the Eagles signed Rocky Boiman. Boiman brings versatility to the linebacking group and toughness to the special teams unit. Tapeh served as the lead blocker for Brian Westbrook. His blocking ability paved the way for Westbrook’s stellar 2007 season. As the fullback is not a featured position in the Eagles' offense, Tapeh collected only 18 yards rushing and 50 yards receiving. The Eagles are still searching for Tapeh’s replacement. Battling for the position is Jason Davis and free agent signee Luke Lawton. Do not expect a big year from either player.